After a 14 year break, Mulder and Scully are back for a 10th season of truth-seeking in a very modern context. Images: FOX, Getty Images. Collage: Maya Dufeu. While kids in the ‘60s and ‘70s got their sci-fi TV kicks with Star Trek and Doctor Who, ‘90s teens got something a bit different with The X-Files. Unlike their space-adventuring predecessors, the show’s two main characters—FBI agents Fox Mulder and Dana Scully—were, for the most part, earth-bound; stuck down here with the rest of us. Their interest was not in conquering new planets, but in unravelling the otherworldly secrets on our own. For a show about aliens, The X-Files is not really a show about aliens. Like all great science fiction, its real concern is in poking at present-day systems: political, societal, and belief. At its heart are two individuals caught in a dance with faith: Scully with her two religions—Catholicism and science—and Mulder, an atheist who desperately wants to find proof that the government is covering up its knowledge of life beyond this planet. Over the course of the nine seasons, The X-Files asked us to look at faith—and its sister, trust—from every angle: Should we put faith in the people we elect to run the country? How about the people we work with? Can you trust your own memories, even? And ultimately, when it feels like the whole world is against you, how do you trust yourself? 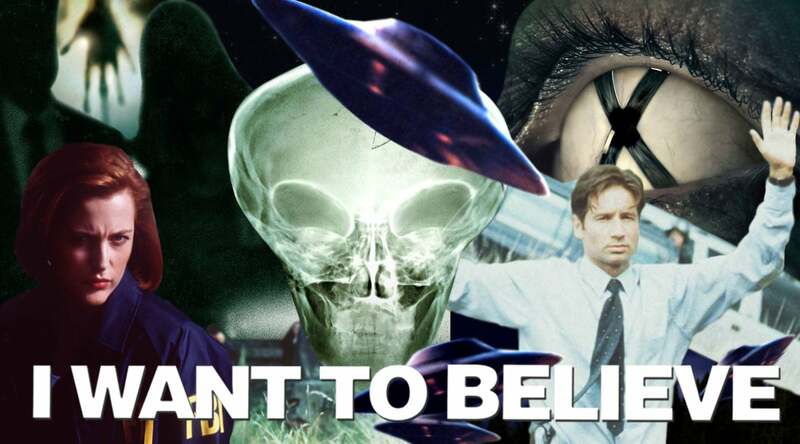 If you’re seeking guidance in today’s injustice-strewn landscape, there are plenty of gnaw-worthy nuggets to be discovered in rewatching The X-Files, which many have done since its episodes were re-upped in HD on Netflix last April. And now, 14 years on from season nine’s hair-raising revelations about a conspiracy to create “super soldiers” with alien powers, Mulder and Scully are about to be reunited this Sunday for a super-brief, five-episode 10th season on FOX, and trust is still the name of the game. However, the context couldn’t be more different. Where Mulder and Scully fought tooth-and-nail for scraps of information, the modern world is drowning in it. But which information is good information—what should be trusted? Someone who has kept his eyes wide open to these kind of questions over the past 20-odd years is The X-Files creator Chris Carter. From an early critique of sexism in the tech industry (“First Person Shooter,” series 7) to a neon sign of an episode about public privacy violation (an NSA agent chillingly says “I know everything about you, you, and you” in “Trust No 1” from season 9), he trusted his instincts to explore storylines that tapped into real world anxieties, often before the media picked up on them. When we talked in November about the context for the new series, over the phone from his L.A. office, his speaking voice was straight out of studio-era Hollywood: steady, polished, impenetrable. The writer-director weighed each question with care, discussing topics like Edward Snowden’s revelations with unrehearsed interest. Carter is neither Mulder or Scully at heart, but rather a keenly proud parent, grabbing any opportunity to point out the tenacity of each of his two protagonists in the face of the search for truth. I watched The X-Files when I was younger but have been steadily rewatching them over the past few years, on DVD then more recently on Netflix, and I've noticed a lot of other people have done the same. Did you foresee that the program would have this much longevity? Why do you think that is? CHRIS CARTER: I think there’s two reasons. I think that this is certainly a good time to be telling these X-Files stories. The world has changed so much since the show went off the air in 2002. I always thought there were more X-Files stories to tell but I think the climate in which we were telling them changed. The second reason is that there's a trend right now in network television to dust off their old titles, things that had popularity in the past, and to reboot them. I think that's another reason they brought it back, simply because they think it might be popular again. For me, it's really the chance to tell new stories today in a different context. There is so much foreshadowing in the show. Where did you get your ideas from? I don't know—I guess reading tea leaves and keeping your ear to the tracks and nose to the wind. I should say, following your instincts. We saw some of these things early on—at least, I did—and it was something to write about. The X-Files has always been topical in that way. While we don't always do headline stories, certainly we try to be cognizant of the zeitgeist. The show also predicts the widespread distrust of government. Are we all Mulder now? It's funny because I've always said it's Scully's show. If it weren't for the science, Mulder would just be another crazy out there, tilting at windmills. So while I believe Mulder's anti-authority, anti-government bent is certainly the thing that narrowly always wins the day, it is Scully's rationalism that is absolutely important to what the show is. The glue of the show, to me, is not the aliens, nor conspiracy, not even the Mulder/Scully relationship. It's the examination of faith: Scully's skepticism yet Catholicism, and Mulder's atheism but blind faith in the supernatural. Why was that dynamic something that you wanted to explore on a personal level? I think people always commented that the stereotypes were busted because typically the woman is the believer and the man is the skeptic, so it was interesting to play it the opposite way. That cross around Scully's neck creates the paradox that is Scully. She's a person of tremendous faith—religious faith—but also faith that science can answer the questions. It's funny, though, now that the show is over 20 years into its run, so many of the things that Scully had faith in have actually come to bear in the science world. When we were writing about clones, there were no clones. It's interesting to see Scully, in the final tally, is chalking up her own victories. Moving into this new season, how have each of their personal faiths weathered the years? Scully's seen so much that it's chipped away at her skepticism—when she was abducted and the implications of that have certainly caused her to come to Mulder's point of view in certain respects. But I still believe that the scientist in Scully is very strong. It is the heartbeat of the show. There is a culture of fear today that wasn't as prevalent when the show first aired. How has that fed into the new season? I think there's an erosion of faith in institutions and a fear of speaking out about them that wasn't there in the ‘90s, for the most part. You see that unraveling a bit now in Missouri. What was it like living through the Watergate scandal? Did everyone have blind faith in the government before that happened? How did it change things? We trusted our leaders, that they were making the right decisions and weren't lying to us about a significant war, and then all of a sudden we find out that they were big cheaters and liars. It turned us all into—overnight, almost—skeptics and cynics. For people my age, and I think everyone, that was a watershed event. I think, philosophically, [it] turned everyone into a critic. That's what the show was capitalizing on, in its essence. Do you think things should have changed? Should there be more transparency, in light of the fact of Edward Snowden's revelations over the last couple of years? It's a tough one. It's funny that the current government—which I find to be exemplary in its protections of our freedoms and liberties—wants to prosecute Edward Snowden. While I believe that there should be protection for whistleblowers, I also believe that there should be secrets to protect us because things cannot be accomplished in the intelligence community without maintaining a certain amount of secrecy. Are you glad he came forward? I think it changed the game, so I believe that... Here's the weird thing about it—it didn't change the game. He sacrificed his freedom and his safety, and what it did was expose that we were being spied on and we were not being told about it. But the amazing thing to me is that we've taken it in stride, and there seems to be an apathy to it. We so freely give up our privacy generally now on the internet, that the idea that we could have people spying on us doesn't seem to matter to people, even though that information could and might be used against you in the future. It's such a strange thing—it becomes part of the news stream and we're shocked for that second and then it slides past our eyes. Information, and the act of chasing it, was a central theme on early episodes of The X-Files—a lot of it was shot pre-internet times. Now we’re drowning in information and it’s hard to know what to trust. It's not so much about searching for it but sifting through it. How do you decide information is good? How do Mulder and Scully? I think there's over 500 conspiracy sites on the internet right now, so as you say they are drowning in information—certainly Mulder is. Now he has the ability to sit in his house, his little house in the middle of nowhere, and go through a lot of what he might had to go and root out personally. Like all of us, he's got to be discerning, and I think that is something you see in the first episode, and certainly through the series. Mulder, which suspicious that his own privacy might be at stake, has now maintained and developed an internet savvy that helps to tell these stories. I read that your initial reaction to the Edward Snowden revelations was that you could see it coming, that you weren't surprised. What's the next big thing that you think we as a society should have seen coming? I don't know. I can speculate, but what you fear is that there's going to be another enemies list, that this information will be extrapolated and we will find a new strain of J Edgar Hoover and possibly an executive branch; if not a formal list, then certainly an acknowledgement that there are people looking who are a sore point. It feels very possible. There's a bit in the first X-Files movie where Mulder and Scully are at a crossroads in the desert, deciding which way a bunch of suspicious unmarked tankers might’ve driven: right or left? Instead, Mulder drives straight on—a third way. I've also seen you give some interviews in which you say that the new series "monkeys" with what we believe at the end of series 9: that Mulder is vindicated in his belief in aliens. Does the new series reflect a third way? I think that's well put and that there is a new way now. Mulder actually has to reassess his entire belief system and what he has come to believe, what he wants to believe. It’s rattled in this new series of six [episodes], and we're looking at, what I think is, a very modern conspiracy through a new prism. Mulder has said to Scully in the past "you keep me honest." Who do you think is doing that for us today? Are there people in the landscape that you look at and go, “thank god they're there” because they're trying to keep us grounded? Once again I'll speak to the first episode—you can call it the pilot episode in this new short series—there are people who come out of the woodwork that do a little bit of what Scully is doing, but from a different perspective. So I think that while Mulder has to reassess his entire belief system, it is done with the help of Scully, the skeptic, but she finds herself enmeshed now in the new equation. There are also certain kindred spirits who come forth that push and pull Mulder in different directions. But he, I think, will always be the iconoclast and take the third way. Over time, have you ever personally shifted on the Scully-Mulder faith scale? Have you wobbled one way or the other over the years? It's funny, I think my skepticism is stronger now than it was before. I always say the aliens owe me a visit because I've been their best PR man for years. Until I have my own faith tested, I've got to say I'm more Scully than Mulder.